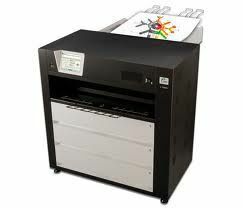 SMGG Has added the superfast printer the KIP C7800 to its ever growing portfolio of high quality machinery. The KIP C7800 gives breakthrough technology and speed by producing LED colour and black & white prints at blistering speeds. Expected to upset the market with its low print cost, sharp quality, and an abillity to print on a huge range of substrates from simple mono drawings to graphic posters for outdoor use. It caters for markets ranging from architects, reprohouses and print production houses. The KIP C7800 wide format printer uses a CMYK solid particle toner system for colour and mono printing that gives outstanding quality at a cost per copy rate that is a fraction of the price of an inkjet printer. Priding itself on being flexible, the Kip C7800 will print media upto 910mm wide, for indoor, outdoor or backlit graphics and the result is a lightfast, odourless, waterproof and ready to finish product.